Like demolitions, refurbishments can put immense strain on the surrounding environment. They can also be unsafe for those accessing the site if risks are not handled appropriately. Even after the refurbishment, the site can still affect people and the environment if precautions have not been put into place. With all this in mind, today we are exploring some of the environmental risks and sustainability issues attached to refurbishments, and how you can control them – from asbestos testing to good ventilation. Reduce, reuse, recycle applies to refurbishments, too. Sourcing salvaged or recycled items is a great way to reduce the footprint your refurbishment leaves on the environment, while minimising the levels of site waste. In terms of using recycled materials for construction, you should be looking for things that are suitable for construction and are commonly recycled. These include cork, wooden boards and timber. Certain manufacturers even recycle glass splashbacks and tiles that you can use in your kitchen. While buying salvaged or recycled items is a great idea, be wary of the potential risks. 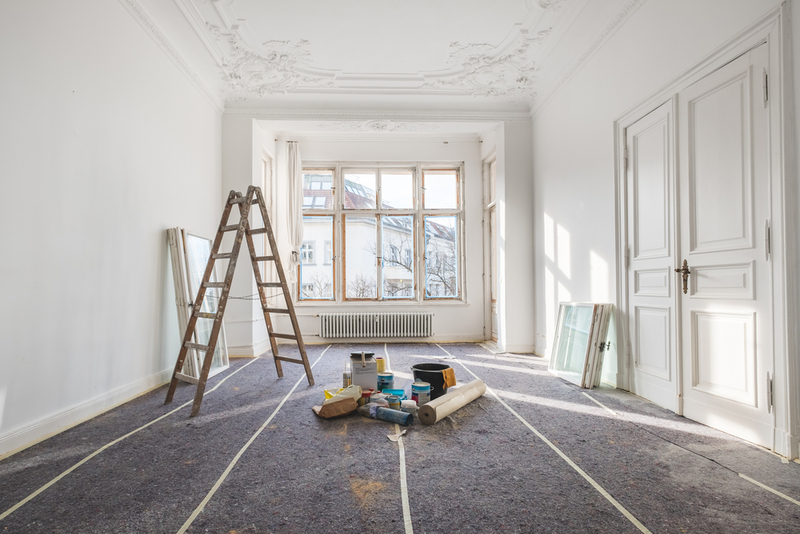 Some things (especially old salvaged fittings, tiles and furniture) may be constructed with materials that are considered hazardous today, such as asbestos. The best way to know if it’s safe for your home is to get lead and asbestos testing on the items, or avoid them if you aren’t sure. Reducing your home’s water usage is a big cost-saver. It also lessens the strain that is put on the local environment. In Melbourne for 2016/17 alone, the average person living in a residential area was using 161 litres per day. While this number was an improvement from previous years, we should all continue to do our parts to save as much of this precious resource as possible. A water-efficient showerhead. These use up to 40% less water during showers. Plus, you can replace your old inefficient showerheads with new efficient ones for free thanks to the Victorian Energy Efficiency Target (VEET) Scheme. A dual-flush toilet. Dual flush toilets save water due to the two flushing options available. Appliances with a high water efficiency rating, such as washing machines, toilets and dishwashers. You should also look for the ‘Smart Approved WaterMark’, as this means that the product has been tested by technical experts to ensure they are as efficient as they claim to be. Did you know that mould has the potential to be a serious health hazard? Yes, even the mould that grows in your bathroom! A good ventilation system is the key to preventing mould – especially in particularly humid areas, such as the bathroom, laundry and kitchen. Therefore, when you’re refurbishing, it’s worth considering upgrading your ventilation in these areas and protect them against mould growth. Place a dehumidifier in the laundry. Some fluorescent tube lamps and low-energy bulbs contain small levels of mercury. Mercury thermometers are also still used, although spirit-containing thermometers are far more common to see. While these small levels of mercury are unlikely to be hazardous to those onsite, it is important to act quickly if a light fixture or thermometer containing mercury happens to break. In terms of refurbishment, some very old fittings and even flooring may contain traces of mercury. To protect everyone onsite from the risk of mercury poisoning, it is essential that you have a professional consultant assess the site. Your contractors should also be made aware of the time period in which your house was constructed. A refurbishment is a perfect time to reconsider what kind of insulation is currently in your home. In Australia, the effectiveness of insulation is measured by its R-value, which is its resistance to heat flow. Therefore, the higher the R-value, the better the insulation performs thermally. Your goal should be to invest in the insulation with the highest R-value within your budget. Having a well-insulated home is synonymous with having a thermally comfortable home; that is, your home will be warm in winter and cool in summer. The right insulation will also minimise the need for air conditioners and/or heaters, which in turn reduces your bills and greenhouse gas emissions. Investing in water-efficient fixtures and appliances is a good first step in saving water. However, after these have been installed, you should continue to uphold the goal to conserve as much water as possible. Install a sink-to-toilet system, which filters greywater from the sink and uses it to flush the toilet. You might be wondering how a wood-burning fireplace is considered eco-friendly when you’re burning trees and emitting smoke from your home. Surprisingly, however, the carbon dioxide that is emitted by burning wood is the same level as the amount that is emitted naturally by the tree once it dies. Therefore, wood is considered to be a ‘carbon neutral’ fuel. The EPA recommends that you use wet or damp firewood for your fireplace. Never burn rubbish, driftwood, or wood that has been painted or treated, as these can produce toxic gases. Sometimes, store-bought test kits can falsely show that there is no lead present on the swabbed area. However, the age of the house may say otherwise. Therefore, the most reliable source you can employ – like with asbestos testing – is a professional consultant. Collecting any materials that are salvageable and recyclable (such as wood, glass and metals). You can either donate these materials to any organisations that will take them, or use a council recycling service. Check with your local council to confirm the kinds of materials that can be recycled and how they can be recycled. Different councils have different rules. Donating any unwanted furniture, toys, bric-a-brac, china, etc. Basically, donate anything you don’t want that can be resold in an op shop for charity. Make sure you double check the items before you donate them to ensure they are still useable. Selling your scrap metal. You can actually make a little side money by selling metal you don’t want or need anymore. Figure out whether the scrap metals are ferrous or non-ferrous. Typically, non-ferrous metals are more valuable, however, some buyers will also accept ferrous scraps. It’s no secret that asbestos is a serious health hazard when it is meddled with. Demolitions and refurbishments are two key processes in which asbestos might be disturbed or displaced from its original position. This makes the refurbishment process a dangerous one if it is not handled correctly. There are two kinds of asbestos: friable and non-friable. Friable asbestos is loose and can easily be crumbled into dust with light pressure. Non-friable asbestos is mixed with a bonding material, such as cement, and therefore cannot be crumbled with light pressure. It is extremely important that you have an environmental consultant assess your site and conduct asbestos testing. Consultants can identify the presence of asbestos, manage the risk and provide maintenance advice that will keep you safe even after the refurbishment is complete. When it comes to removing hazards from your refurbishment site, do not attempt to DIY the process. For the safety of yourself and everyone that will be on the site before, during and after the refurbishment, you need to contact an environmental consultant for risk management advice. Alpha Environmental is a team of professional environmental consultants that are highly skilled and experienced in conducting asbestos testing. Our thorough assessments will leave you with strong assurance that your site is safe for everyone. Contact us today for an obligation-free quote for asbestos testing on 1300 039 181.